In a previous page – How to tap test a guitar Part 1 – I talked about the first steps in producing a tonal signature by tap testing, and how to use Audacity software to record and analyse the tap. In How to tap test a guitar Part 2 I want to complete the description of how I analyse the spectral signatures I end up with, using Excel to produce charts that allow direct comparison between taps. Just looking at Audacity Fast Fourier Transform charts like the one below is all very well, but they’re so detailed and spread across the whole audible sound spectrum that it’s hard to make sense of them, even though it’s obvious there’s pattern and structure there as you’d expect from something musical. Guitar makers are mainly focused on the 80 to 1,000Hz range because that carries information we can actually use to take control of the sound. Players wanting to compare guitars, though, may be interested in the whole range from 80 to around 3,000Hz because that’s the whole response of the instrument we can hear. Just a reminder: remember we’re measuring response in deciBels (dB) where a difference of around 3dB is a DOUBLING of sound level. 10dB is a difference of 10 TIMES, and 20dB is a difference of 100 TIMES. It would be perfectly reasonable to stop at this point and admire all the different tap signatures you collect one by one just using the Audacity window, but I think you’ll quickly see the limitations of that. 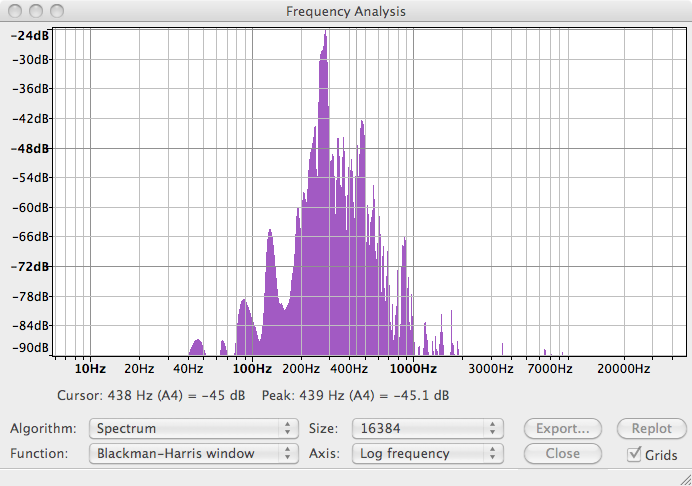 You can save the tap tracks on Audacity if you want, and come back to analyse the recording as often as you like. Or, you can take screen shots and keep the signatures as JPEG files. What you can’t easily do is overlap different taps so you can compare directly, as you might for example if you want to win an argument that says Matons are better than Martins, for example (a silly example, because you can’t prove any such thing – but you get my drift I hope). So the next step is to export all this information in a form that will allow you to plot it as a graph using Excel. At this point I’m going to assume you know how to use Excel charts reasonably well, but I will perhaps give more detailed instructions later on if anybody wants – you can contact me through the Contact me page on this site. The format I use for exporting is .txt because it’s easy to import into Excel, which will be the step after this. So, as you already guessed while I’ve been droning on, now hit the Export… button. Save the data file somewhere handy, making sure it’s in .txt form. Create a new Excel workbook. I usually start out with two tabs, one labelled DATA and the other GRAPH. In the DATA worksheet, select Data menu from the toolbar, then click on Get External Data/Import Text File… . Follow the string of Excel-ish dialogue boxes through to its inevitable conclusion, and you should find a very large set of data magically appearing in the worksheet. Here’s where I assume you know how to create a new chart and plot the data. I normally plot the horizontal Frequency axis from 0 to 500 or 1,000Hz to suit my purposes, and use a linear rather than logarithmic scale. 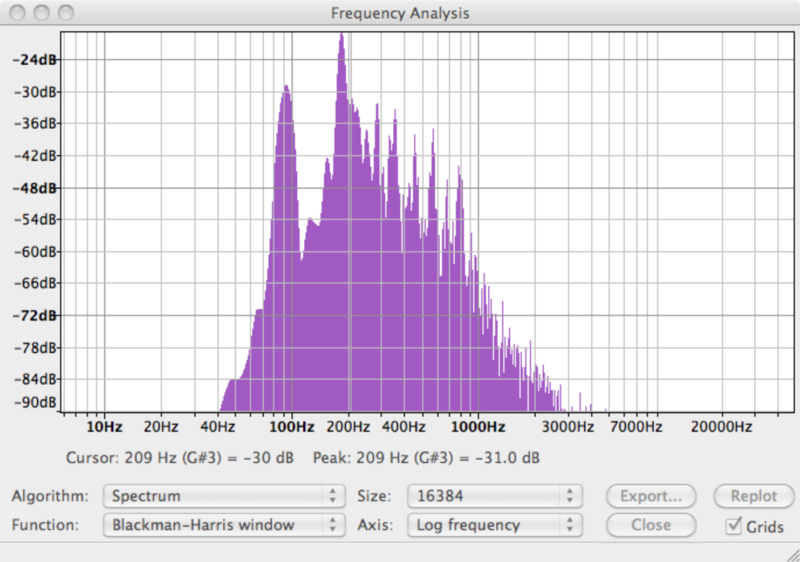 If you want to see all the data range (up to around 3,000Hz usually) you might want to use a logarithmic scale instead. And on that probably very annoying note this page reaches its end, gets into its jimjams, and stumbles off to bed with a hot water bottle, because here in Canberra tonight it’s FREEZING! As part of my series on building a bamboo guitar, I’ll go into the tap tone analysis of the instrument in detail. This entry was posted in Tap testing and tagged frequency spectrum, spectral signature on May 26, 2013 by Michael Williams.